Woah. I didn't post anything yesterday. And it was a week day. And I usually post every week day. So weird. I have been noticing lately that winter is getting to me. This always happens every year. Living in Northern Ontario, I usually start feeling a bit down around the middle of winter. I have more trouble concentrating than usual and don't feel as motivated to do things. I start dreaming of Spring and Summer. I wish that it was still Fall so that I could go outside and do things in weather that isn't too hot or too cold. I have to force myself to push through and get things done. I look for inspiration. I look for things to help me like music and meditation. I find things that make me happy and make me feel good. One of these things is fireplace videos. 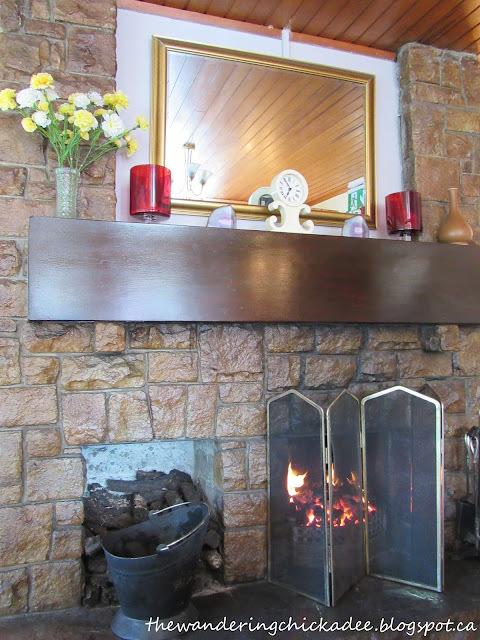 My dad loves fireplace videos, although he always prefers enjoying a real fire, like the one in our woodstove at our camp or the peat-fed fire in the lounge at the Killarney View House in Killarney, Ireland (pictured above). That being said, I have found some great fireplace videos for the times when we don't have a real fire to enjoy and I hope you enjoy them too! Fireplaces are so relaxing and fireplace videos are an easy way to bring that form of relaxation into your home. I chose fireplace videos that aren't Christmas-y so that you can enjoy them all year (that means no Christmas music and no Christmas decorations), although I even enjoy the Christmas fireplaces at other times during the year as long as they only have Christmas decorations and don't have any Christmas music. Without further ado, here's my list! I have included the links to my favourites! 3 Hour Fireplace Video by MoneySavingVideos: This is one of my dad's favourite fireplace videos. It has the sounds of the crackling fire and, at one point in the video, you can hear a train in the distance. It even has someone stoking the fire once in a while! This will definitely make you feel like you are really there! Campfire by the River by TheSilentWatcher: Many fireplace videos are basically the same so it's nice to find fireplace videos that are different like this one! This video has a campfire by a river with a tree overlooking the river. There are also bird sounds. Campfire + beautiful landscape + nature sounds = feels like you're camping. Fireplace Videos by SPACEStv: SPACEStv has various fireplace videos using different kinds of fireplaces! These have no music and simply have the relaxing crackling sound of the fire. They all say yule log but they aren't all Christmas-y. Check out this great list! These are just a few fireplace videos out there but they're pretty great! Let them warm up your winter and help you push through until Spring arrives!